Rangers defeated Aberdeen 3-0 at Ibrox on Wednesday night where a reinvigorated side put Derek McIness’ charges to the sword, courtesy of a switch to a midfield diamond. Graeme Murty, lamenting two bruising defeats to Hamilton and Dundee, bemoaned the lack of clinical finishing in the two game but the Glasgow side were not only much more efficient, the rejigged system allowed them to compete with a reputably dogged team. Pedro Caixinha persisted with a version of 4-4-2 until his sacking in late October, and caretaker Murty had continued that while adding a degree of fluidity to the style. Here, though, the decision to go for a narrower midfield was met by an Aberdeen back three. Kari Arnason, Scott McKenna and Anthony O’Connor struggled to stem the flow down their left flank as Rangers exploited the spaces down the sides. McIness’ conservative approach backfired and it was a puzzling decision to grant Rangers time to play out through the back as other teams have found relatively simple pressing schemes to force the ball long. This game saw a change in the positional play of the midfield when in possession. Bruno Alves, shifted to the right centre-half berth to accommodate Danny Wilson, was given more time to pick his passes than usual thanks to the positioning of McCrorie. The 19 year-old maintained enough lateral distance between himself and Alves to allow him to progress up the park as Christie was unable to press alone as he would be allowing a free out-ball to the youngster. Jack, meanwhile, took up a much higher position than normal behind the Dons’ midfield line and ghosted in behind Kenny McLean several times. Tavernier, so often the main source of creativity down the flank, was without Daniel Candeias who dropped to the bench, but in this game his starting position was deeper than usual, which saw Andrew Considine forced high up the park. The ploy was to expose Aberdeen’s vulnerability in the channels by dragging them out of shape, and in the first-half the home side were successful in achieving this. McCrorie’s positioning prevents Alves from being pressed. Tavenier’s deeper starting position creates the space for Jack to dart into. Kenny Miller and Josh Windass dropped into pockets of space behind Graeme Shinnie and Greg Tansey to further disrupt McKenna and Arnason as they opted to follow them into the midfield zone. As a two-pronged attack, Carlos Pena often occupied the defender who usually act as the spare man. Miller and Windass were extremely mobile in offering width to stretch the back three, another factor that helped Rangers to transition effectively. Miller drags O’Connor into a wide area. With Windass and Pena occupying the other two CBs, Rangers combine by using the third-man run to breach the space. Aberdeen struggled to penetrate Rangers’ midfield in the first-half, and McIness’ decision to field so many defensive-minded players was evident in their ponderous possession. 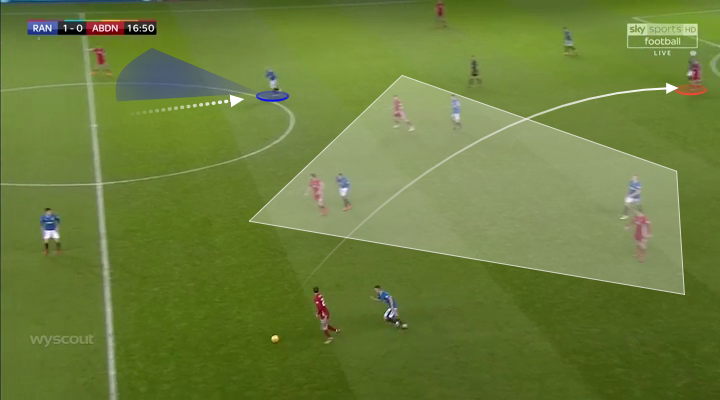 There was no real thought behind where they were shifting the ball and Rangers easily showed them inside where they cut off passing channels well. Holt and Jack shuffled across to block progress down the flanks when the ball reached the full-backs but Christie had to regularly drop deep to influence the play and found his options limited. If the ball was played infield from the right, either Windass or Miller would drop back to cover the pass out wide to the full-back. Abereen’s centre-backs were reluctant to step up the park and receive ahead of Miller and Windass so they were often forced to go long. 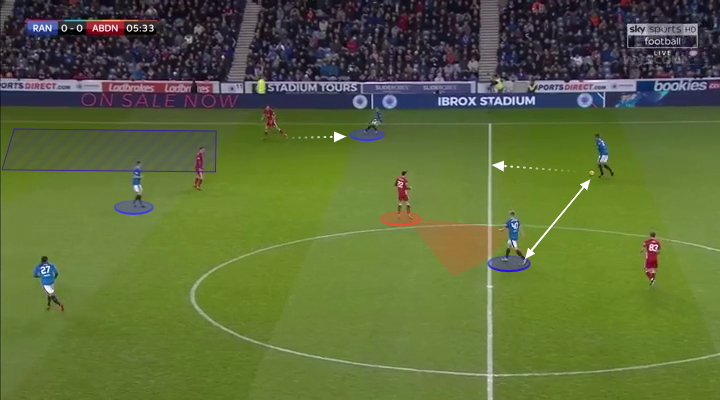 When the ball returned to an Aberdeen defender this was the trigger for Rangers to squeeze up the park, with Pena leaving the deepest midfielder to create what was essentially a full-court press with Rangers 3v3 in the final third. Rangers showed Aberdeen infield and did well to block passing lanes, which forced Aberdeen to play back and go long. Here, the only real option for Christie to play a positive pass is a hooked ball to May. Rangers have improved this season when competing for second balls and putting synchronised pressure on the ball when it is overturned. In recent weeks though the emphasis on maintain compactness between the lines vertically has clearly been lessened. Hamilton were able to play quickly from their own third to the final third but the diamond shape saw Rangers dominate every loose ball in the centre of the park. 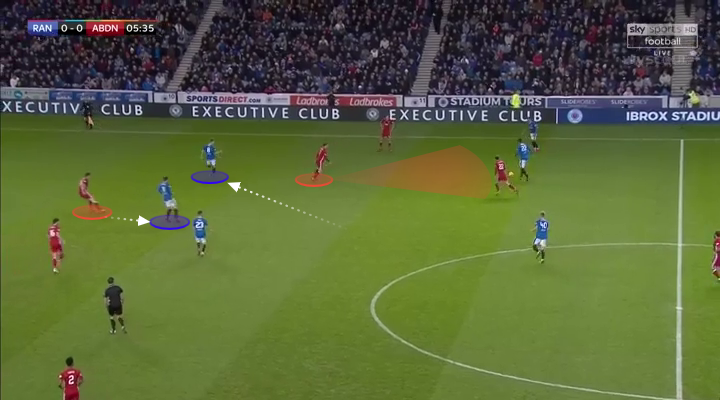 The spacing of the side gave Holt, Jack and McCrorie the platform to aggressively commit to challenging for these duals, whereas Windass and Candeias didn’t offer meaningful pressure when tucking inside from the wings. There was a real lack of width from Aberdeen in the first-half and Rangers were able to crate overloads by sucking a red shirt into the centre of the park to help reduce the numerical advantage in the engine room. McIness sought to rectify this by bringing on winger Gary Mackay-Steven just before half-time, reverting to his preferred 4-2-3-1 formation. Rangers’ tempo dropped after resuming play and the change in the dynamic of the midfield saw the visitors grow into the game. Jack and Holt were forced to double up in wide areas due to the new threat of an overlap but this opened up space as Pena was too high at the apex of the diamond to function as a traditional central midfielder, while McCrorie, who had been sitting deep to protect his two centre-halves, didn’t push up to reduce the vertical distance between himself and the Mexican. Jack and Holt were occupied by Aberdeen’s full-backs now, and this opened up space for Shinnie and McLean to pick up the ball. Aberdeen threatened on occasion, and while Rangers didn’t create as many clear-cut chances as their play warranted at times, they dominated the character of the match. It was a convincing win in what is anticipated to be Murty’s penultimate game in the hot-seat and offered a viable alternative to the consistent 4-4-2 utilised so far in the league campaign.